Sporting events rely on having an army of volunteers to help them run smoothly but Tokyo 2020 will be a little different - robots will be helping out. The Tokyo 2020 Robot Project will assist wheelchair users at the Olympic Stadium with robots carrying food and drink and providing event information. Power assisted suits will also be used at venues and athlete villages. The suits are designed to ease human workload and will be used to move heavy objects and for waste disposal. 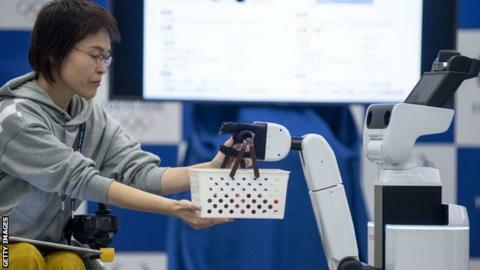 "This project will not simply be about exhibiting robots but showcasing their practical real-life deployment helping people," Hirohisa Hirukawa, leader of the project said. "So there will be not only sports at the Tokyo 2020 Games, but some cool robots at work to look forward to as well." Have robots been used at Paralympic and Olympic events before? Yes, but in a more limited capacity. At Rio 2016, specialist robotic cameras captured still images above athletes in the badminton competition, while a robot was on display at the Paralympic opening ceremony. Robots are also used to retrieve apparatus such as javelins and shot puts during field events, while robotic sensors are used in NHL ice hockey games. In 2012 there was also 'RoboWorld Cup' competition in Bristol to coincide with the London Olympics, taking part in events such as football, basketball and weightlifting. Watch out human athletes, the robots are coming.